The following lecture is devoted to the thorough discussion of Limbs. Section one is primarily focused on the Embryonic Origin of Limbs. The educator starts off by giving an Introduction of the topic and then presents an extensive overview of Embryological Origin. Moving further, the educator discusses Embryological Development in addition to Hand and Foot Development. Apart from this, a demonstration of Rotation of Limbs is provided followed by an elucidation of Cartilage Formation and Joint Formation. In section two, light is shed on Osteogenesis. The educator extensively explains the process of Ossification. To further elaborate on the topic, the educator highlights Intramembranous Ossification and Endochondral Ossification. In section three, the educator covers the topic of Limb Development. 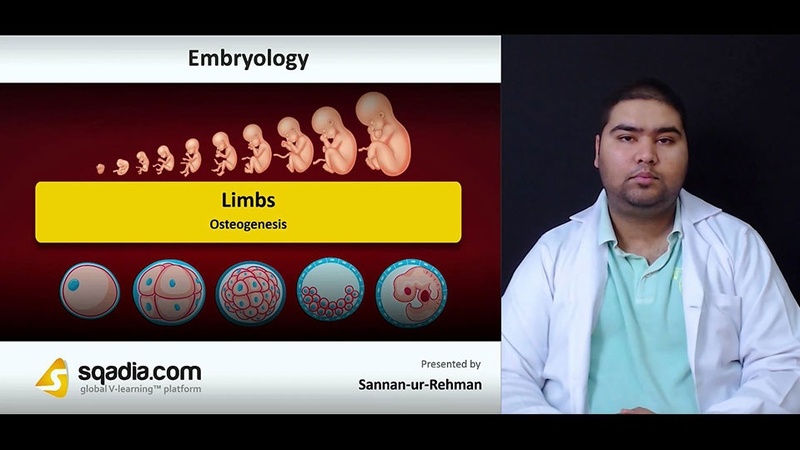 Firstly, the educator speaks about Limb Osteogenesis and puts forth extensive information regarding Joints. Afterwards, light is shed on Limb Musculature which is thoroughly addressed by the educator. Section four is about Molecular Regulation. A comprehensive overview of Genes involved in this process is presented followed by a discussion of Anteroposterior Axis and Dorsoventral Axis. At the end of this section, demonstration of Limb Bones is put forth by the educator. The prime focus of section five is the elucidation of Clinical Correlates. The educator elaborates on Limb Defects in this section. Various disorders of Limbs such as Defects with Digits and Cleft Hand are addressed by the educator. Moreover, the educator also speaks about Hand Foot Genital Syndrome, Osteogenesis Imperfecta, Marfan Syndrome, Arthrogryposis, Amniotic Bands, and Congenital Hip Dislocation.